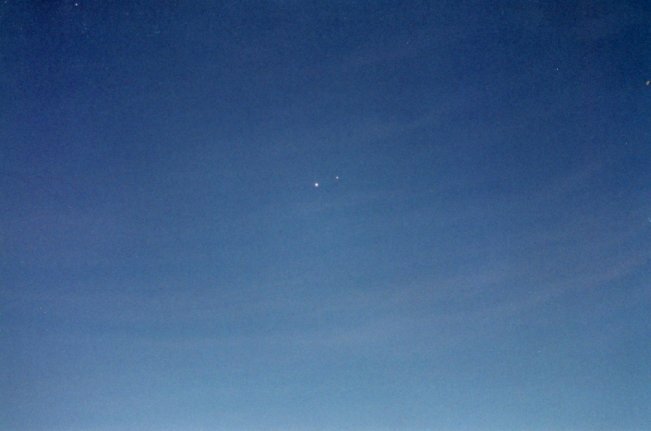 Photo of the Week.. Venus and Jupiter appear just barely past conjunction, Jupiter the fainter of the two, on the morning of November 5, 2004. Faint clouds that were not visible to the eye enhance the scene. Watch a three-day progression in the twilight morning sky. Astronomy news for the week starting Friday, November 26, 2004. Welcome to December, and while it is not yet astronomical winter, we get the sense of its approach with the lowering of the Sun and the cooling of the air and land. During early fall, the Sun drops quickly below the celestial equator. As December begins, it is nearly 22 degrees to the south of it, and is now not changing its north-south position much at all, just down to 23.4 degrees south by December 21, hence the term "solstice," loosely meaning that the "Sun stands still" (in its north-south motion), which gives our northern climes time to chill. The week begins -- on Friday November 26th -- with the full Moon. Since the Sun is approaching the Winter Solstice in Sagittarius, the full Moon is approaching the Summer Solstice in Gemini. By Monday the 29th, the waning gibbous will fall smack in the middle of the classic constellation, while on Tuesday the 30th it finds itself passing five degrees north of Saturn (which is now rising early, around 8 PM), when the pair will make a nice triangle with Pollux. That same day the Moon is also at apogee , where it is farthest from the Earth. By the end of the week, the Moon will be close to its third quarter (which will take place on Saturday, December 4). The morning sky continues to dominate the planetary scene. Jupiter, high to the southeast in Virgo as dawn brightens the sky, leads the lot. Down and to the left in a long line find Spica (Virgo's luminary), then much brighter Venus. Ending the stream just a bit below Venus, and much fainter, is Mars. As Venus prepares to pass to the north of the red planet, the two draw close, the formal conjunction taking place the morning of Sunday, December 5. The closeness is in line-of-sight only of course, as Venus is inside the Earth's orbit and Mars is outside of it. On December 1, Mars will be 1.7 times farther away from us than Venus, in part accounting for its relative faintness. (Being farther from the Sun, smaller, and rocky, it also reflects less light than cloud-covered Venus). The stars of northern autumn are slowly giving way to those of winter. As the sky darkens look well to the south for a classic fall star, Fomalhaut in Piscis Austrinus, the Southern Fish. Below it, skimming the southern horizon (and lost to those much north of 40 degrees north latitude) is the charming figure of Grus, the Crane, one of the few "modern" constellations that sort of looks like what it represents. To the north of Fomalhaut lie Aquarius, whose "Y"-shaped "Water Jar" straddles the equator, and Pegasus, which lies in the northern celestial hemisphere. As the evening moves on, watch Orion climb the eastern sky, followed by Sirius, which rises about an hour after Saturn.